Home » Events and Blogs » Blog » Are you deficient? Do you notice cracks on the corner of your mouth? This could indicate you have a deficiency in iron, zinc and B-vitamin or that you’re not getting enough protein. What about red/white acne-like bumps on your arms, thighs or buttocks? This could indicate you have a deficiency in essential fatty acids, vitamin A or vitamin D deficiency. Do you ever have tingling, prickling and numbness in your hands and feet? This could indicate you have a deficiency in B-vitamins, particularly folate, B6 and B12. Our bodies are designed to send us warning signs when we’re lacking in essential nutrients, just like the ones above. 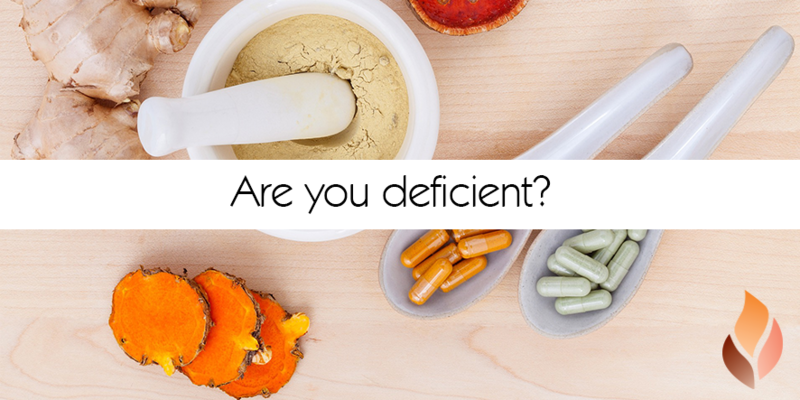 Mild vitamin and mineral deficiencies can present themselves in many different ways and can usually be counteracted with a high quality supplement or by changing your diet slightly. Check out these common mild vitamin deficiencies and how they can be combated! B1 Thiamin This vitamin is necessary for energy and to ensure proper function of the nervous system. Note that this vitamin is usually lost in the cooking and processing of food. Fatigue, tenderness and cramping in the calf muscle, numbness or pins and needles, irritability. Pork, tuna, brown rice and asparagus. A high quality Vitamin B supplement would also be beneficial. B6 Pyridoxine This vitamin is important for hormonal balance and the creation of neurotransmitters, such as the serotonin and dopamine. Lumpy breasts, sores in the mouth, PMS, depression, insomnia. Chicken, tuna, spinach, red meats, nuts, legumes, seeds and avocado. Biotin (B7) This vitamin aids in metabolising fats, carbohydrates and amino acids not to mention strengthening your hair and nails. Hair loss and a red, scaly rash (especially on your face) Eggs, Alaskan salmon, avocados, mushrooms, cauliflower, nuts, raspberries and bananas. Calcium This vitamin provides teeth and bone with strength and is vital for muscles and nerves. Teeth that chip easily, dental cavities, muscle cramps, brittle nails. Dairy foods, tofu, nuts, seeds, whole grains, Asian greens, broccoli, spinach, tinned sardines and salmon (including the bones!). A high quality calcium supplement would also be beneficial. Magnesium This vitamin is important for those who may be pre-diabetic or insulin resistant, and for muscle relaxation. Twitching, cramping and spasm of muscles, anxiety. Nuts (particularly almonds), soy, spinach and whole grains. A high quality magnesium supplement would also be beneficial. Zinc This vitamin is important for hormones and the reproductive and immune systems. Stretch marks, impaired taste and smell, poor wound healing, white spots on nails. Seafood, meat, eggs, dairy and seeds.